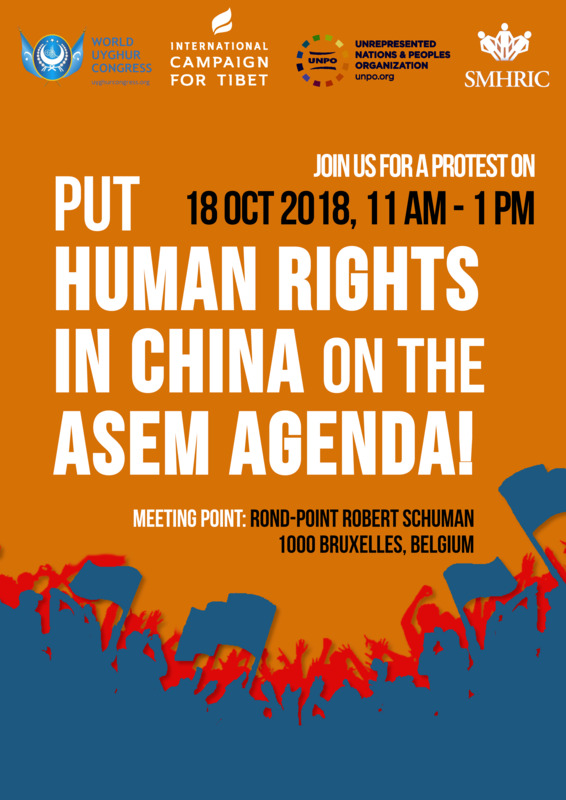 UNPO: Protest: Put Human Rights in China on the ASEM Agenda! "The leaders of democratic countries participating in the 12 ASEM Summit should push for the inclusion of Human rights issues and the rule of law into the official agenda," said the International Campaign for Tibet’s EU Policy Director Vincent Metten. "This International gathering presents an opportunity for the EU to raise its concerns with foreign head of States and governments about grave violations of human rights occurring in several ASEM countries such as China. In particular, we urge EU leaders to raise with the head of Chinese delegation, Prime Minister Li Keqiang, the lack of reciprocity in the relations between the EU and China and the problem of access to Tibet for European diplomats journalists and tourists". "Uyghurs, Tibetans, Southern Mongolians and all those who call for their basic rights and freedoms in China are under attack. It is becoming an existential problem, as everything that makes us unique, our language, culture, religious beliefs and ethnic identity are being targeted in a systematic campaign of forced cultural assimilation," said the President of the World Uyghur Congress, Dolkun Isa. "We realise that the EU has many geopolitical and economic factors to consider, but common humanity and human rights should always be at the core of EU policy. This summit is an important opportunity for the EU to reassert its commitment to human rights and European values by raising these crucial issues with their Chinese counterparts."